"I had them at Shalom." These words are attributed to Rabbi Yechiel Eckstein as he was on his way back to Chicago in a rented compact Chevy with author Zev Chafets after Eckstein addressed a group of Christian Zionists at the Family Christian Center in Munster, Indiana. I've read every book that Zev Chafets has written. Zev's books are hard to put down -- they are witty, provocative, and informative. I've known Zev Chafets my whole life. He is a family friend who was once married to my mother's best friend. His most recent book, however, I read not because of the author but rather because of the subject matter that intrigued me. A couple years ago when I was directing the monthly Synaplex program for Adat Shalom Synagogue in suburban Detroit I needed to find an interesting speaker to follow Shabbat dinner. I put in a phone call to Zev in New York who graciously accepted my invitation to come to Adat Shalom (he is a native Detroiter who grew up in Pontiac). He told me he would talk about his current project -- Christian Zionists and the Judeo-Evangelical Alliance. It was December 2005 and Zev was about to travel to Israel with a group of Evangelicals as part of his research for A Match Made in Heaven, his new book (a chapter in the book is Zev's travelogue from his Christian pilgrimage). Zev spoke brilliantly at Adat Shalom about the phenomenon that is the passionate love that Evangelical Christians feel for the State of Israel (and how they back this up with their charitable commitments to Israel). I hadn't previously given much thought to Christian Zionism, but like most Jews at the time I was fairly skeptical about the motivations behind Christian support of Israel. Following Zev's talk, my interest was piqued. Over the course of the ensuing two years, I read as much as I could about Christian Zionism, I invited Pastor Glenn Plummer (Fellowship of Israel and Black America) to address my synagogue in Ohio, I was captivated by an emotionally charged speech by Pastor John Hagee at the AIPAC Policy Conference, I dialogued with Israeli tour guides Linda Olmert and Danny Ehrlich of Keshet Israel about their experiences guiding Christians through Israel, and most recently I completed Zev's book. Zev devotes an entire chapter to an individual who has committed his life to reaching out to Christian Zionists for the sake of Israel and Israelis. He characterizes Yechiel Eckstein as an Orthodox rabbi who "had become a televangelist." Eckstein, who runs the International Fellowship of Christians and Jews, has raised millions of dollars from evangelical Christians and given that money away to Jewish charities. Zev spends much time with Eckstein -- both on the road and at his headquarters in Chicago -- and provides the reader with an in-depth perspective about Eckstein's background and the motivation for his work. One thing is clear in Zev's evaluation of Eckstein (right), his popularity among Christians is unmatched among Jews. Eckstein has long had detractors in the major American Jewish organizations, especially the Anti-Defamation League where Eckstein got his professional start. In Zev's book, he quotes ADL executive director Abe Foxman "as accusing Eckstein of selling the dignity of the Jewish people by pandering to Christians." Israel's political leaders have long appreciated and recognized the importance of Christian tourism in Israel (a point made several times by Zev in his book). Further, following John Hagee's well received AIPAC speech in March, strong supporters of Israel among the Jewish community have learned how vital and reassuring the genuine Christian support of Israel is. And a major development this week may change the way the Jewish community views Christian Zionism. The JTA reports that "thousands of evangelical Christian donors now have a powerful seat at the table of the Jewish Agency for Israel, the vanguard of the Zionist movement. The Jewish Agency announced last week it has forged a 'strategic partnership' with the International Fellowship of Christians and Jews, an organization that depends primarily on conservative Christian donors to raise tens of millions of dollars per year to help Israel and impoverished Jews in the Diaspora." 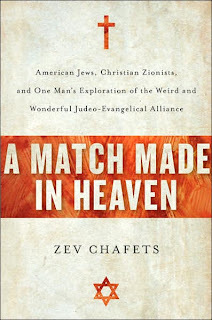 Perhaps this news will give Zev Chafets cause to pen a new epilogue to the paperback edition of A Match Made in Heaven: American Jews, Christian Zionists, and One Man's Exploration of the Weird and Wonderful Judeo-Evangelical Alliance. It is a wonderful book and I highly recommend it to anyone interested in Israel and the Christian support of the Jewish state. Hopefully, Zev Chafets will alleviate the concerns and cynicism the American Jewish community has about Christian support of Israel. As Zev eloquently puts it, the evangelical Christian Zionists in America are "not the enemy. They are the enemy of the enemy, and they want to be accepted and appreciated. In return they are offering a wartime alliance and full partnership in a Judeo-Christian America. It is an offer the Jews of America should consider while it is still on the table." Well said. The Forward article about Yechiel Eckstein and the International Fellowship of Christians and Jews getting a seat on two of the Jewish Agency's most powerful committees in exchange for a mega-million dollar donation is here. I can't help but wonder about the evangelicals. Their support comes with a price and their agenda is not the same as ours. What Chafets is saying is that we should have a relationship with Evangelicals SOLELY on Israel. Not only is this frankly short-sighted, it's frankly shallow. For there to be a true alliance, there must be dialogue that leads to reconciliation on the domestic front, and perhaps theologically as well. Anything less is simply dangerous.